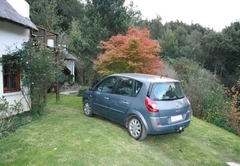 Bubuhle is a highly recommended property providing self catering in Hogsback for tourists visiting the Amatola region. 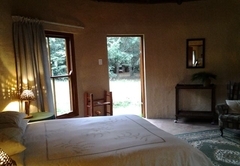 Bubuhle is a 15-acre property in its own valley with a perennial tumbling stream and wetland. 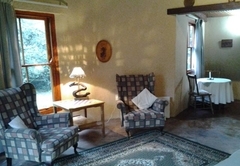 We offer three self-catering cottages in this quiet romantic retreat situated high in the Amatola Mountains. 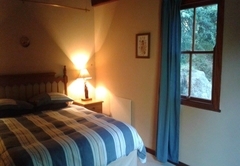 Bubuhle Self-Catering Cottages in Hogsback is a quiet romantic retreat situated high in the mists of the Amatola Mountains in the Eastern Cape. 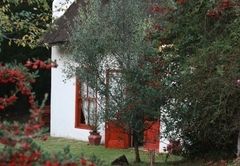 Hogsback is renowned for its scenic beauty during all seasons: the profusion of blossoms in spring, the cascading waterfalls and verdant green of the indigenous forests in summer, the splendour of the oaks, maples and many other deciduous trees in autumn, and the magic of light snowfalls in winter. 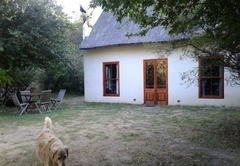 This thatched cottage has an open-plan sitting, dining and kitchen area with fireplace. 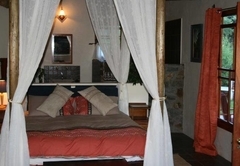 The main bedroom has a queen-size bed, with en-suite shower and toilet. 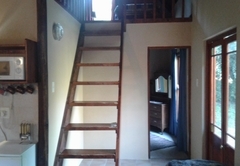 Overlooking the living area is a mezzanine level with two single beds. 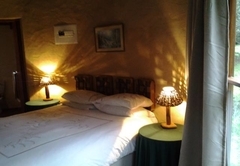 The kitchen is equipped with gas stove and geyser, microwave oven and fridge, as well as all the required cooking and eating utensils. Bedding and towels are provided. 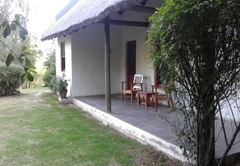 There is a braai area outside and firewood is supplied. 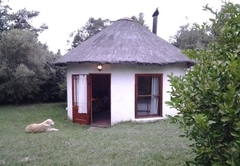 This luxury thatched cottage is open-plan with a queen-size four-poster bed and sitting area in front of an open fireplace, and a kitchen/dining area extension. 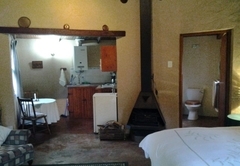 There is an open shower and separate toilet, as well as an outside shower. 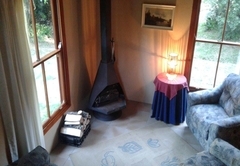 The cottage has a covered verandah. 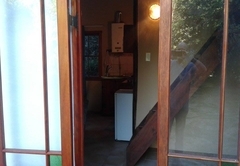 The kitchen is equipped with gas stove and geyser, microwave oven and fridge, as well as all the required cooking and eating utensils. Bedding and towels are provided. 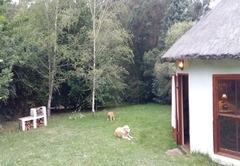 There is a braai area outside and firewood is supplied. 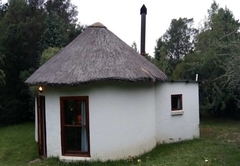 This rondavel thatched cottage has a queen-size bed, two easy chairs and a fireplace in its main section, with en-suite shower and toilet. 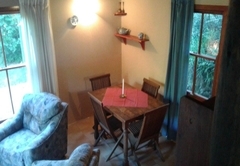 The kitchen/dining area extends in an open-plan design from the rondavel. 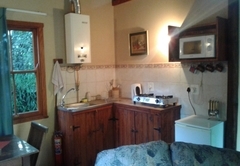 The kitchen is equipped with gas stove and geyser, microwave oven and fridge, as well as all the required cooking and eating utensils. Bedding and towels are provided. 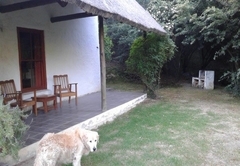 There is a braai area outside and firewood is supplied. 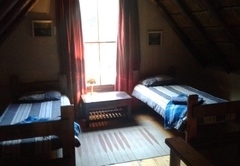 Hogsback has a number of hotels, pubs and eateries where meals can be obtained should you not wish to self-cater! 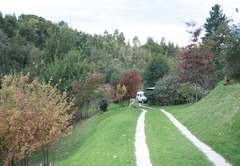 There are numerous scenic walks, hiking and cycling trails of varying length and difficulty. Horse-riding is available and the two public dams are stocked with trout for those who would like to try their hand at fly-fishing. 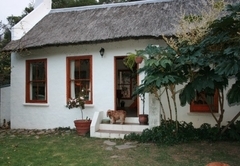 Pet friendly, lovely place to stay.